KABUL, Afghanistan (CNN) -- A fighter jet crashed in southern Afghanistan on Monday, in the fourth wreck in three days, authorities said. 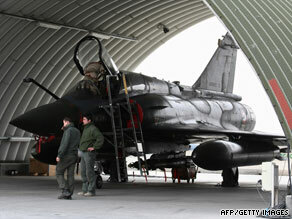 A French Air Force Mirage 2000 sits under a shelter on the tarmac at an airbase in Kandahar on January 1, 2009. Authorities were looking into why the plane went down during takeoff from Kandahar airfield Monday morning, but the role of insurgents had been ruled out, said Lt. Col. Paul Kolken, the spokesman at the airfield. The crew ejected safely, and was being treated, Kolken said. Five hours after the crash, the wreckage of the plane was still on fire. Military officials did not identify the type of jet that crashed, nor did they release the nationality of the crew. Weather conditions were fair at the time of the incident, Kolken said. On Saturday, a U.S. fighter jet crashed in eastern Afghanistan, killing its crew of two. And a military helicopter made a hard landing elsewhere on Sunday, apparently injuring at least some of those on board, NATO said. None of the aircraft were shot down, said the International Security Assistance Force -- NATO's mission in Afghanistan. It did not announce the cause of any of the crashes. At least five people were killed when a helicopter went down in southern Afghanistan's Helmand province Tuesday, a local government official said. And on July 6, two Canadian air crew members and a British soldier were killed when a helicopter crashed during takeoff in Zabul province, the Canadian and British defense ministries said.